"Hi Henry - Well I have installed my glass pieces." "I am finally getting around to tiling my kitchen backsplash after a complete kitchen redo last year. 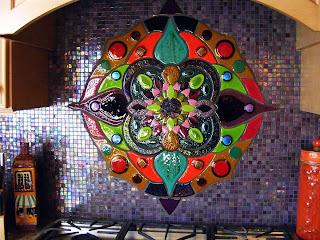 I have designed and fused a glass "mural" for over my cooktop. I am still looking to purchase mosaic tiles to fill in the balance (most likely mesh backed - either Vidrepur or Sicis). I have tiled many times before (mostly porcelain) but have never tiled with glass. I understand this is a different animal and am not too concerned about the mosaics but am concerned about the mural. The mural has approximately 20 pieces, the largest being the center which is about 13" x 13" (four leaf clover shaped piece). The overall design is 32" x 32". Do you think there would be any problem installing this with the same glass adhesives used for 1" mosaic sheets? I had thought that I would apply the adhesive to the wall and back butter the pieces as well.... Appreciate any advice or direction ~ thanks, Jeanne"
That is one impressive centerpiece, and incredible work! !